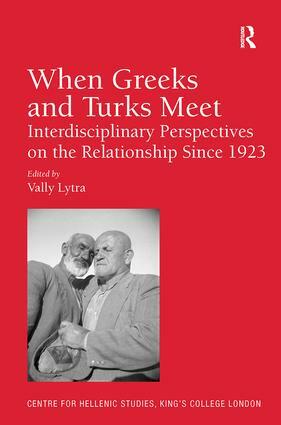 The relationship between the history, culture and peoples of Greece, Turkey and Cyprus is often reduced to an equation which defines one side in opposition to the other.The reality is much more complex and while there have been and remain significant divisions there are many, and arguably more, areas of overlap, commonality and common interest.This book addresses a gap in the scholarly literature by bringing together specialists from different disciplinary traditions - history, sociology, anthropology, linguistics, literature, ethnomusicology and international relations, so as to examine the relationship between Greeks and Turks, as well as between Greek Cypriots and Turkish Cypriots, since the founding of the Republic of Turkey in 1923. When Greeks and Turks Meet aims to contribute to current critical and comparative approaches to the study of this complex relationship in order to question essentialist representations, stereotypes and dominant myths and understand the context and ideology of events, processes and experience. Starting from this interdisciplinary perspective and taking both diachronic and synchronic approaches, the book offers a fresh coverage of key themes including memory, history and loss; the politics of identity, language and culture; discourses of inclusion and exclusion. Contributors focus on the geographical areas of Greece, Turkey and Cyprus and on the modern historical period (since 1923) up to the present day, offering in some cases an informed perspective that looks towards the future. When Greeks and Turks Meet will be essential reading for students and researchers working on the cross-roads of Greece, Turkey and Cyprus, on South-East Europe and the Middle East more generally. It will also be a valuable resource for students and researchers in inter-cultural communication, cultural and media studies, language and education, international relations and politics, refugee and migration studies, conflict and post-conflict studies. Contents: Foreword by Roderick Beaton, Yorgos Dedes and Bengisu Rona; Introduction, Vally Lytra. Part I Rethinking Remembrance and Representation: History, memory and emotion: the long-term significance of the 1923 Greco-Turkish exchange of populations, Renée Hirschon; Situating loss in the Greek-Turkish encounter in Cyprus, Olga Demetriou; Rethinking Greek-Turkish relations: conversations with my Greek and Turkish university students, Hercules Millas; Greeks and Turks meet the Rum: making sense of the sounds of ’old Istanbul’, Panagiotis C.Poulos. Part II The Politics of Identity, Language and Culture: Does a Cyprus solution still matter?, James Ker-Lindsay; The good, the bad and the ugly: Greek Cypriot and Turkish Cypriot schoolbooks on the ’history of Cyprus’, Yiannis Papadakis; ’Whether you see them as friends or enemies you need to know their language’: Turkish language learning in a Greek-Cypriot school, Constadina Charalambous; Greeks’ attitudes to Turkish features in their language, Peter Mackridge; Early literature of the Asia Minor disaster and of the War of Independence: where Greek and Turk have yet to meet, Natasha Lemos. Part III Discourses of Inclusion and Exclusion Revisited: The Convention of Lausanne (1923): past and current appraisals, Konstantinos Tsitselikis; Incorporating the ecumenical patriarchate into modern Turkey: the legacy of the 1924 patriarchal election, Dimitris Kamouzis; Cultural identity in ’fragile’ communities: Greek Orthodox minority media in Turkey, Eylem YanardaÄŸoÄŸlu; Running the Greek Orthodox schools: law and administration in late Ottoman and republican education in Turkey, AyÅŸe Ozil; ’Like a bridge over troubled water’: reforming the education of Muslim minority children in Greece, Thalia Dragonas and Anna Frangoudaki. Index. Vally Lytra is Lecturer in Languages in Education, at Goldsmiths, University of London. She is also Visiting Research Fellow at the Centre for Hellenic Studies, King's College London, and convened the 'Greek Turkish Encounters Lecture Series' from 2003 to 2008. She is the author of Play Frames and Social Identities. Contact Encounters in a Greek Primary School (2007). She has also co-edited Multilingualism and Identities across Contexts: Cross-disciplinary Perspectives on Turkish-speaking Youth in Europe with Jens Normann JÃ¸rgensen (2008) and Sites of Multilingualism: Complementary Schools in Britain Today with Peter Martin (2010).